Moonshadow is the newest edition to our fleet. Atlantic Scuba owns and operates it’s own 10m hard boat, which is available for full charter. ‘Moonshadow’ is a Category 3 MCA coded vessel, licensed to carry 14 people including 2 crew. It is fitted with a reliable Yanmar 240HP engine, it is both spacious and comfortable. 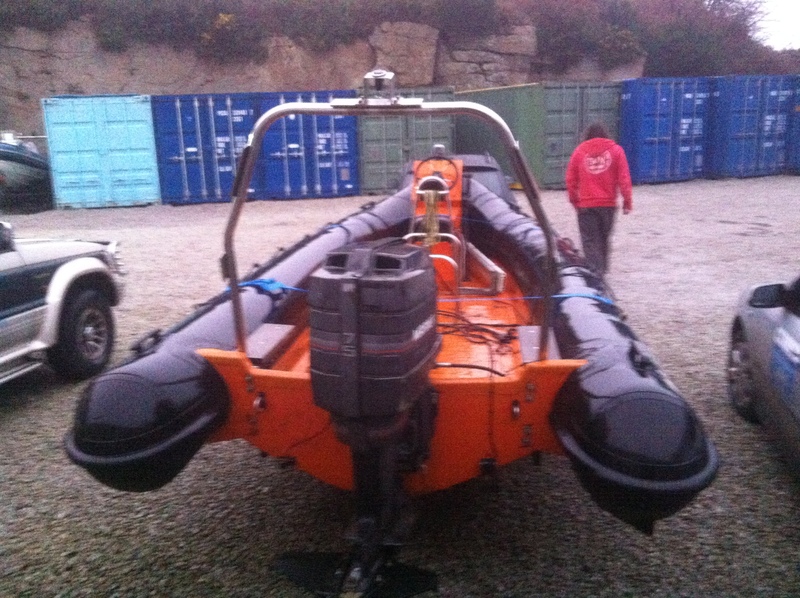 Atlantic Scuba owns and operates two Rigid Hulled Inflatable Boats (RHIBs) as well as a 10m hard boat. 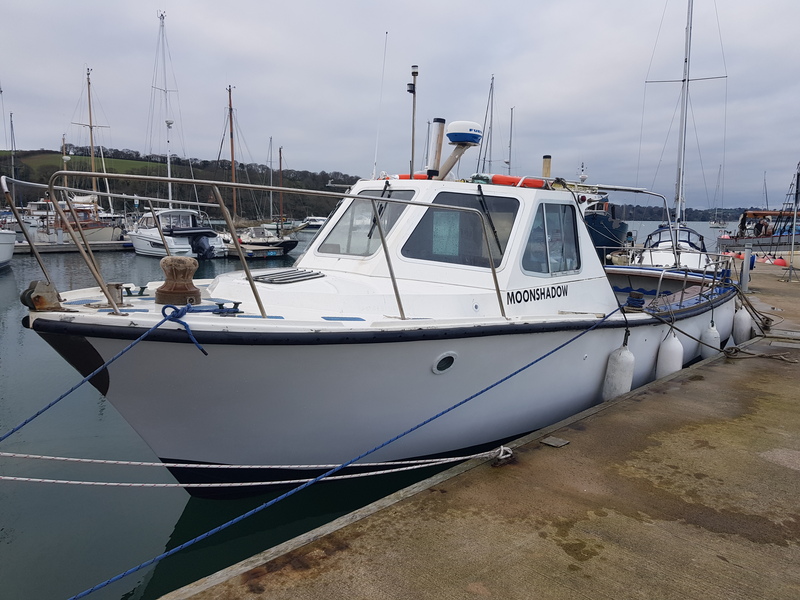 Stingray is moored in the Fal River at Mylor, ideally situated for access to Falmouth Bay, the Manacles, the Lizard, Gerrans Bay and Veryan Bay. It also makes it ideal for small groups and individuals, for our advertised scheduled dives. Starfish is kept on a trailer, to be launched anywhere it is required. This may be Plymouth, Penzance, Hayle, Newquay or Rock. It can be booked as a complete boat charter only, we do not offer individual spaces unless it is being used in conjunction with Stingray, when Stingray is fully booked. Moonshadow is moored at Mylor Yacht Harbour, close to Stingray. It has easy access to the Carrick Roads, Falmouth Bay, the Manacles, the Lizard, Gerrans Bay, Veryan Bay and Dodman Point. Available for full boat charter for a single dive or multi day diving. It can also be relocated anywhere along the south Cornish coast, including Penzance, Mevagissey, Fowey or even Plymouth. Wreck Hunter is a support vessel for our coded vessels. It is permanently mounted on a trailer, so can be launched anywhere, although it has to be used in conjunction with a coded vessel. 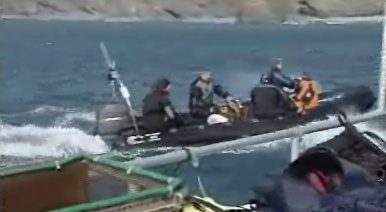 Atlantic Scuba owns and operates a RHIB (Ridged Hulled Inflatable Boat) as a support boat. ‘Wreck Hunter’ is used as a support vessel to either Stingray or Moonshadow, it is not coded for commercial use but can be used in conjunction with either. It can carry any extra equipment that may be required, whether that may be diving equipment, filming or survey equipment. It has a reasonable sized deck area for it’s size and it is fitted with a single Mariner 75HP 2 stroke engine, it is fast, reliable. 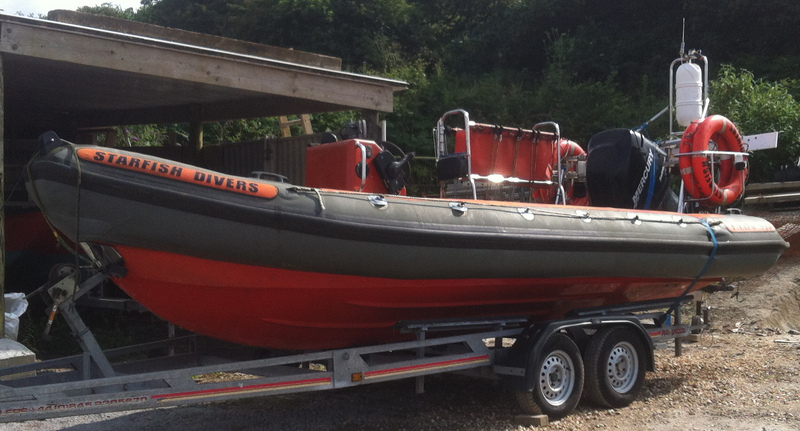 Available only for hire alongside one of our coded vessels, and only for equipment carrying use. Wreck Hunter can be launched from almost anywhere in Cornwall. To wherever our coded vessels are required. Wreck Hunter has been used as a support vessel for various projects, a glimpse of it in action was spotted on BBC 1 South West’s Inside Out. When not in use as a support vessel, we use it for personal use, hunting wrecks, hence the name, ‘Wreck Hunter’. Starfish is currently being completely rebuilt, replacement engine, new tubes, new electronics, in fact the only original part left will be the hull. It should be ready for the 2020 season. This page will be active again once Starfish has undergone it’s rebuild. Atlantic Scuba owns and operates two RHIBs (Ridged Hulled Inflatable Boats) as dive charter boats. ‘Starfish’ is a Category 4 MCA coded RHIB, licensed to carry 12 people including the boat skipper. It is fitted with a single Mercury 200HP Optimax 2 engine, it is very fast, reliable, quiet and comfortable. 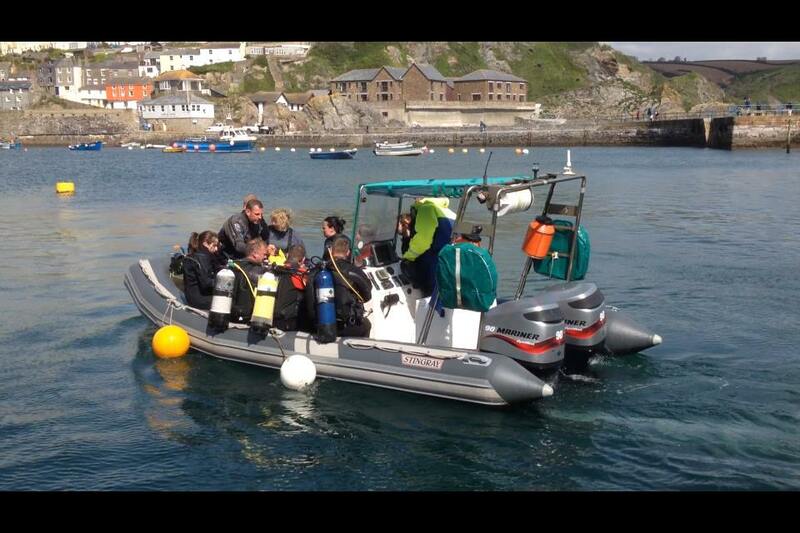 Atlantic Scuba owns and operates two RHIBs (Ridged Hulled Inflatable Boats) as dive charter boats. ‘Stingray’ is a Category 4 MCA coded catamaran RHIB, licensed to carry 12 people including the boat skipper. It is fitted with two 90HP engines, it is fast, reliable and comfortable.